Essai sur l’Étude de la Littérature (London: Becket & De Hondt, 1761). Critical Observations on the Sixth Book of [Vergil's] 'The Aeneid' (London: Elmsley, 1770). The History of the Decline and Fall of the Roman Empire (vol. I, 1776; vols. II, III, 1781; vols. IV, V,VI, 1788–1789). all London: Strahan & Cadell. A Vindication of some passages in the fifteenth and sixteenth chapters of the History of the Decline and Fall of the Roman Empire (London: J. Dodsley, 1779). Mémoire Justificatif pour servir de Réponse à l’Exposé, etc. de la Cour de France (London: Harrison & Brooke, 1779). "Lettre sur le gouvernement de Berne" [Letter No. IX. Mr. Gibbon to *** on the Government of Berne], in Miscellaneous Works, First (1796) edition, vol. 1 (below). Scholars differ on the date of its composition (Norman, D.M. Low: 1758–59; Pocock: 1763–64). Mémoires Littéraires de la Grande-Bretagne. co-author: Georges Deyverdun (2 vols. : vol. 1, London: Becket & De Hondt, 1767; vol. 2, London: Heydinger, 1768). Autobiographies of Edward Gibbon, ed. John Murray (London: J. Murray, 1896). EG's complete memoirs (six drafts) from the original manuscripts. The Private Letters of Edward Gibbon, 2 vols., ed. Rowland E. Prothero (London: J. Murray, 1896). Gibbon's Journal to 28 January 1763, ed. D.M. Low (London: Chatto and Windus, 1929). Le Journal de Gibbon à Lausanne, ed. Georges A. Bonnard (Lausanne: Librairie de l'Université, 1945). Miscellanea Gibboniana, eds. G.R. de Beer, L. Junod, G.A. Bonnard (Lausanne: Librairie de l'Université, 1952). The Letters of Edward Gibbon, 3 vols., ed. J.E. Norton (London: Cassell & Co., 1956). vol.1: 1750–1773; vol.2: 1774–1784; vol.3: 1784–1794. cited as 'Norton, Letters'. Gibbon's Journey from Geneva to Rome, ed. G.A. Bonnard (London: Thomas Nelson and Sons, 1961). journal. Edward Gibbon: Memoirs of My Life, ed. G.A. Bonnard (New York: Funk & Wagnalls, 1969;1966). portions of EG's memoirs arranged chronologically, omitting repetition. The English Essays of Edward Gibbon, ed. Patricia Craddock (Oxford: Clarendon Press, 1972); [hb: আইএসবিএন ০-১৯-৮১২৪৯৬-১]. 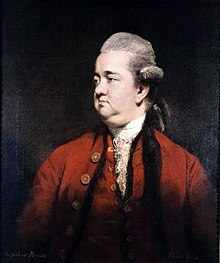 ↑ Gibbon's birthday is 27 April 1737 of the old style (O.S.) Julian calendar; England adopted the new style (N.S.) Gregorian calendar in 1752, and thereafter Gibbon's birthday was celebrated on 8 May 1737 N.S. Complete History of the Decline and Fall including Gibbon's Vindication, courtesy: Christian Classics Ethereal Library of Calvin College, Grands Rapids, Michigan, USA. Biographer Patricia Craddock's comprehensive bibliography through May 1999. Craddock's supplement to her Reference Guide.